Honey Locust (Gleditsia triacanthos): growing, planting, caring. 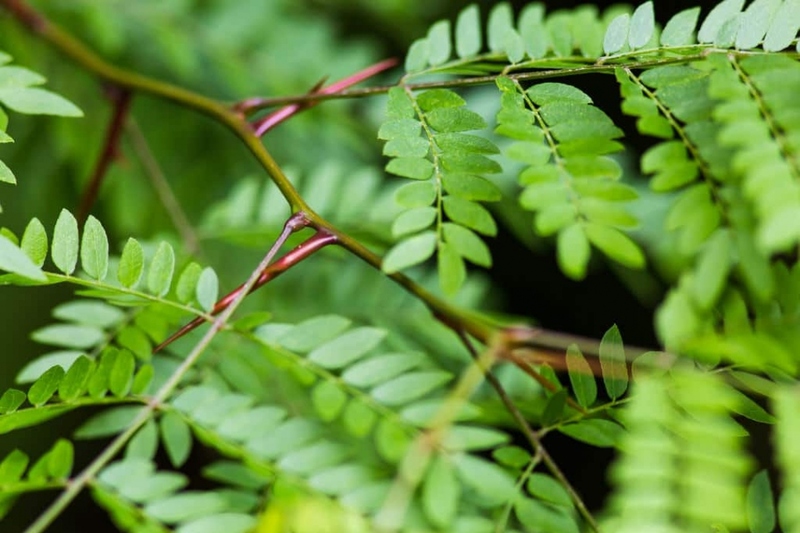 The honey locust - Gleditsia triacanthos - also known as the thorny locust, is a deciduous tree in the Fabaceae family, native to central North America where it is mostly found in the moist soil of river valleys. The botanical species - Gleditsia triacanthos -is famous for its branched red spines becoming brown. Its thornless cultivars are used extensively in gardens and streets, where its resistance to pollution and drought is appreciated. Note that the honey locust is a member of the fabaceae family, like beans, funny, right? Honey locust is a pretty large tree - 42 m - in its region of origin. To recognize it, you will notice large reddish brown pods about twenty centimeters after flowering. The leaves are deciduous, compound, alternate, pinnate, and have 15 to 30 leaflets each. In autumn they are tinged with yellow before falling. Plant your honey locust in any soil. Oh yes. Plant preferably in winter, in bare roots or in mound. Dig a hole deep enough, twice as large as the root ball, without mixing the layers of the soil. Plant a solid stake at the bottom of the hole, on the edge, inclined to the prevailing winds. Cut the root hair - the fine roots that looks like hair - to balance the volume of roots and foliage. Plant without burying the boundary between trunk and roots of the tree, putting the soil layers in the same order you removed them. Tamp the soil around the roots with your foot, so you do not leave a pocket of air, and attach the stake to the trunk with a suitable extensible link. Form a hollow in the soil and water abundantly until you fill it. Water regularly and generously for several weeks after planting. After, you only have to worry about watering in case of severe drought. Water plants kept indoors every week. The pruning of the honey locust is not essential, but it will define its appearance in the long term. It is necessary to regularly prune the low branches to obtain a trunk, in the long term. The first years it is also necessary to remove the branches which cross and those which return towards the interior.